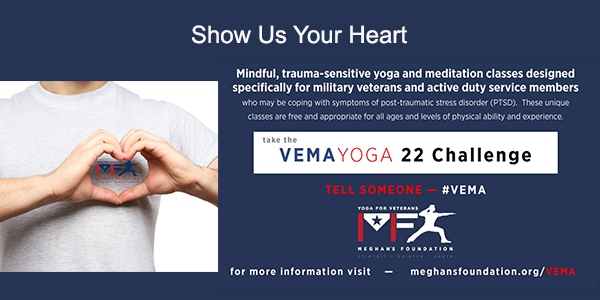 This February, instead of spending all that money on candy and flowers, why not show how much you care by donating to the VEMA YOGA program at Meghan’s Foundation? Just $22 provides 2 VEMA classes to a deserving veteran. Please consider a regular donation. Learn more about donations here. Help spread the word about this important program. Show us your Heart Pose! Challenge your friends, post photos on your social networks, tag Meghan’s Foundation, and spread the word using #VEMA. Send your Heart Pose pictures to VEMA@meghansfoundation.org for posting on our website. The VEMA Challenge is intended to increase awareness of VEMA YOGA and the benefits that yoga and meditation can have on the quality of life of veterans and active duty military and their families. VEMA YOGA (Veteran’s Meditation And Yoga) is mindful, trauma-sensitive yoga and meditation classes designed specifically for military veterans and active duty service members coping with symptoms of post-traumatic stress disorder (PTSD). These unique classes are free and appropriate for all ages and levels of physical ability and experience. If you know a veteran or active duty service member please help us spread the word about this unique program. next post: Need a Good Reason to Donate? How about 22?